Oops - yet another rose book high on the list of my all-time favourite books. I'm a great lover of the David Austin 'English' roses, and they grow well in my garden, so this book is a must-have. 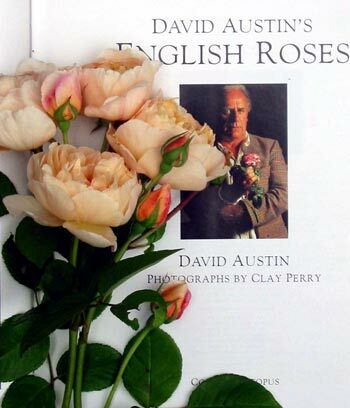 David Austin, photos by Clay Perry. This is THE book for lovers of the David Austin English roses, with the most amazing range of soft pastel pinks, peaches, creams, apricots, salmons, and whites imaginable. The ratings the author gives to his roses may surprise some southern hemisphere readers, as rose growth and health is very much affected by location. The author comes across as an honest and knowledgeable breeder and grower. The rationale behind his rose breeding programme seems obvious and sensible - to combine the best of the old with the best of the new. He has been very successful. Now David Austin English roses are popular and available throughout the rose-growing world. They do perform differently in different countries though.